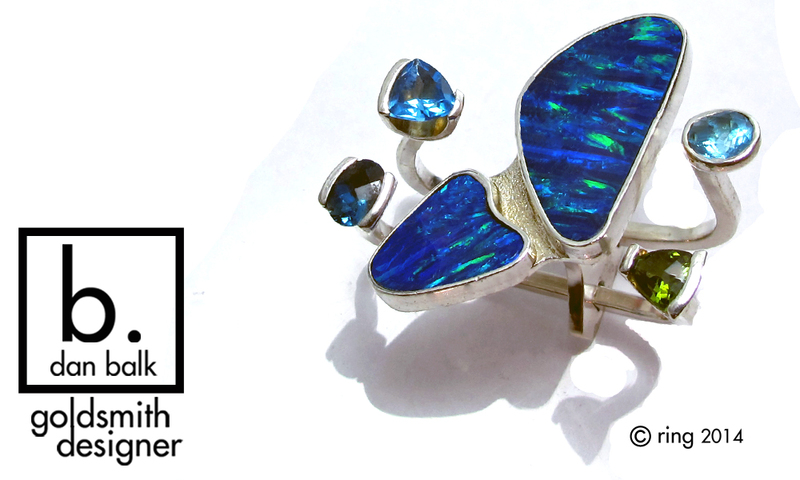 Welcome to DanBalkJewelry.com, home of artist, teacher, goldsmith, and designer, Dan Balk. Take a moment to view Dan’s collection of contemporary fine art jewelry on this site. Each piece of jewelry is one of a kind, designed by Dan, who creates his own sterling silver, 18K and 14K gold alloys that he fashions, mills, forges, fuses and brazes into miniature sculptures for personal adornment. Dan selects and sets each stone, often performing his own lapidary work on select stones. This allows Dan complete contact and artistic connection with each piece of fine art jewelry from concept to collection. Call to purchase for $275.00 (813)728-4325. We ship in the US. Dan Balk designed this beautiful contemporary ring. It is sterling silver and a size 6. The ring has a unique featured stone, a checkerboard cut London Blue Topaz; It is a round 9 mm stone and sits with 3 smaller stones around the base, including 2 blue topaz, 3 mm round each and 1 amethyst, also 3 mm round. Dan hand fabricated this ring from raw, recycled, materials. Celebrate love this season by creating lasting memories of artistic adventure. These intimate, one-on-one, silver jewelry making classes are taught by artist and designer goldsmith, Dan Balk. Our jewelry studio offers participants an exciting venue to work together and discover new abilities to express their creative sides making jewelry under the guidance of a professional jeweler. What better opportunity to share a unique, singular experience creating basic rings from raw materials. Safely, couples create and play together as they melt their own alloy, pour ingots of molten metal to shape, form, solder, polish, and shine their rings to a beautiful finish. Partners learn about jewelry in Dan’s fully equipped studio. Each class is private, enabling each participant to learn skills and techniques. This course concludes with complimentary offerings of champagne or wine, as well as fruit and chocolate. This event is perfect for date-nights, anniversaries, birthdays, as well as wedding band creation and more. Couples will go home with their finished handmade rings. Dan Balk, has opened his jewelry studio for couples ring making classes by appointment, weekday mornings and evenings. No experience is needed. Reservations are required. Each class is approximately 3 hours long. Classes are daily by appointment. Dan Balk Jewelry Studio is offering a Summer of Love special half off discount for the Couples Jewelry Making Class. If you book your private class before July 31st, 2019, Dan will give you a 50% discount (A savings of $225.) The regular price is $450. The sale price for the class is $225. The offer expires 7/31/19. Supplies are included. A $50 reservation fee is required to reserve your date. For more information or to schedule your class, call Nataly Balk at (813) 728-4325. No experience is needed. Classes are one-on-one. Reservations are required. Each class is approximately 4 hours long. Students will go home with their finished silver jewelry. This can be a one day basic introduction for the novice to a 5 day basic intensive for the crafter/artisan. Dan is offering a summer special: Buy 1 Class, Get the 2nd Class Half off. The discount is a savings of $112.50, the regular price is $450. Students are required to buy their first 2 classes for $337.50 before July 31, 2019. Supplies are included. Call to reserve your class, 813-728-4325. Dan is currently accepting custom orders. Each handmade piece requires time to make.